THE WAIT IS OVER!!! 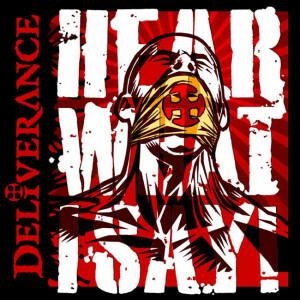 Deliverance’s final album entitled Hear What I Say! will be released officially on December 10th, 2013. Hear What I Say! has been one of the most talked about and anticipated thrash metal albums of 2013. Fan reaction all over the internet has grown to a fever pitch in anticipation. When the demo track of The Annals of Subterfuge from the upcoming Thrashmageddon compilation album started making the rounds the chorus’s of approval have been deafening. 3 Frogz Records and Roxx Records are extremely excited to announce that the new album HEAR WHAT I SAY! has been fully recorded and mastered and is currently being manufactured for release! This is the final offering from this legendary thrash band! There you have it, the album the world has been waiting for the 10th and FINAL long awaited album from Deliverance! And also a special treat for our German fans with the very first ever German language track from Jimmy Brown and Deliverance. As an additional bonus the first 200 copies will also feature a Limited Edition poster that will be hand numbered and signed by Deliverance front man and founder, Jimmy Brown. But get those orders in quick, there will only be 100 available from 3 Frogz Records and 100 from Roxx Records!